We will be adding new content to this page soon. Please check back in a few days. Brighten up your bathroom with these Rather Be Fishing Towels, featuring a printed band with a collage of icons from the great outdoors in various shades of green, ivory, and red. The Pine Branch Towels feature an embroidered design of delicate pine branches on a textured linen look band that is highlighted with contrast stitching. These deep chocolate-brown towels will complement your lodge bath decor. 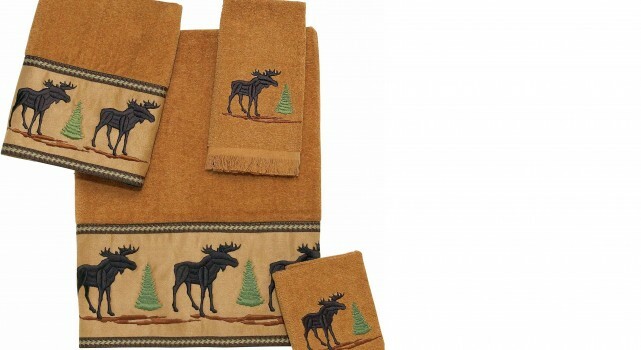 These luxurious tobacco tan towels feature a deep border with embroidered brown moose and green pine trees on the bath and hand towels with the embroidered moose repeated on the tip towel and wash cloth. Warm up your cabin or lodge bath with these rustic bath towels. Rustic Pine Cone Bath Towels feature embroidered pine cone, rich in detail on ivory color 100% cotton towels. The Gilded Birds Towel Collection features a beautifully embroidered trio of birds perched on branches on a 100% cotton ivory towel. The birds are finely detailed in blues, yellows and oranges with black, green, white and red accent colors to work with any decorating scheme. Enjoy super-soft terry cotton with our Rustic Montage Wildlife Towel Set. These oatmeal beige towels feature satin wildlife scene patched that are accented with olive green stitching. A green and beige twill band finishes off the edges of each towel. Bordered with a rich, brown jacquard paisley finished with an elegant gold and brown trim on a 100% cotton java towel, the Bradford Towel Collection works with almost any décor, adding a touch of elegance and sophistication. The Lakeville Bath Towels feature an iconic lake-inspired embroidery with pine trees, paddles and a moose with a “Lake” patch.